Anticipation of a need for single-seat float-equipped interceptor seaplanes prompted the Japanese navy to initiate a development programme for such aircraft in 1940, the Nakajima A6M2-N floatplane adaptation of the famous Mitsubishi A6M2 Zero being intended as a stopgap until a purpose-designed aircraft could be introduced. This was to be the highly-imaginative and attractive Kawanishi N1K Kyofu (mighty wind), whose design was started in September of that year. Featuring a central float and twin wing-mounted stabilizing floats, the new prototype retained the same gun armament as the A6M2 but was powered by a 1089kW Kasei 14 radial engine driving two-blade contraprops in an attempt to counter the torque-induced swing on take-off. The wing-mounted floats were originally intended to be retractable but design problems led to these being fixed before the aircraft's first flight. Persistent trouble with the contraprop gearbox resulted in a change to the Kasei 13 engine driving a single threeblade propeller from the second prototype onwards. First flown on 6 May 1942, the N1K1 went on to trials with the navy, whose pilots were enthusiastic about the performance, although expressing misgivings over the tricky take-off characteristics. In the air, with its combat flaps, the Kyofu handled beautifully and possessed excellent manoeuvrability. At a time (the end of 1942) when the Zero naval fighter had effectively won air superiority for the Japanese in the Pacific, the N1K1 was ordered into production, but the delivery rate was slow to accelerate and fortunes changed rapidly during 1943. Thus in December of that year, with only 15 aircraft being completed each month and Japanese offensive initiative dwindling, it was decided to end production of the aircraft, and in March 1944 the last of 89 Kyofus was delivered to the service. 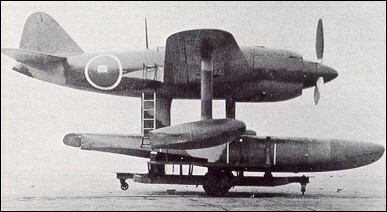 Codenamed 'Rex' by the Allies, the N1K1 was first deployed for the defence of Balikpapan in Borneo, whose recovery by the Allies was regarded as no longer pressing as American forces surged closer to the Japanese homeland, while the Japanese then lacked the carriers with which to protect their isolated garrisons. In the final weeks of the war NlKls flew alongside the 'Rufes' of the Otsu Kokutai from Lake Biwa in defence of central Honshu against the increasing American raids on Japan. It was ironic that so promising was the N1K1 that the Japanese had reversed the process of adaptation, and with it produced the N1K2-J 'George' landplane fighter, certainly one of the best Japanese aircraft to see combat during the war. I saw this plane with the other FE planes around 1967. I jumped the fence and got into a few. Too bad they left them out to weather. all planes are now to museums and most are restored. fantastic! there was a Zero, the Rex, Tenzan, ME 262 A George, and a German Arado float plane. There are some pics on-line of the whole line up of planes back in the 70s. Some changed camo several times. The aircraft in the Nimitz Museum had been in storage at NAS Norfolk, Virginia until the summer of 1975, when it was delivered to the museum for restoration. Are we sure this is the aircraft at Pensacola? I've heard that it is now at the Nimitz Museum in Texas (in the George Bush Gallery). NAS Pensacola, awaiting resoration at the National Museum of Naval Aviation. As a kid, I used to climb all over the aircraft that lined the fence at NAS Willow Grove. I was glad to see this page, as I couldn't remember what aircraft it was. I hope to see it restored soon! The floatplane fighter was not quite the oddity that it seems on the surface. Although such an aircraft would lack the performance to deal with opposing fighters, it would be a useful counter to attack or recon aircraft where carrier-based fighters were not available for whatever reason. A floatplane launched from a CAM ship against a FW-200 Condor would be one, as would a launch from a German raiding cruiser or battleship against Swordfish/Albacores/Barracudas. I grew up not too far from Willow Grove NAS and remember passing the Kyofu mant times. I'm happy to hear it is now (hopefully) indoors and awaiting restoration. It was getting pretty beat-up by the time I left PA in 1978. The aircraftt formerly displayed at NAS Willow Grove is currently stored at NAS Pensacola, awaiting resoration at the National Museum of Naval Aviation.